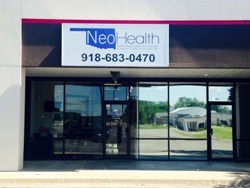 NeoHealth Muskogee, NeoHealth's newest health center, was opened on October 12th, 2012. This center, funded through the Affordable Care Act enables NeoHealth to provide a more complete circle of care for our patients of the Muskogee area. People drive for long distances to seek care with our providers, because our providers know your health is our utmost concern. The space includes 6 exam rooms, one procedure room and one laboratory. Please note this after hours line is only answered from 5 p.m. to 8 a.m. on weekdays, and is also available Weekends and Holidays.